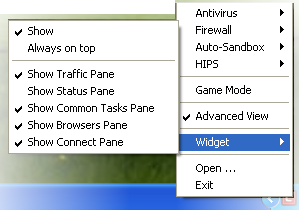 The options available for the Antivirus, Firewall and Auto-sandbox menu-items depend on whether you are using Compact View or Advanced View. Antivirus - You can enable or disable Real-time antivirus scan. Firewall - You can enable or disable Firewall. Auto-Sandbox - You can enable or disable Auto-Sandbox. Refer to the section 'Behavior Blocker' for more details. Antivirus - Options available are On Access, Stateful and Disabled. Refer to Antivirus Pane for more details. Firewall - Options available are Block All, Custom Ruleset, Safe Mode, Training Mode and Disabled. Refer to the section 'Firewall Behavior Settings' for more details. Auto-Sandbox - Options available are Fully Virtualized, Partially Limited, Limited, Restricted, Untrusted, Blocked and Disabled. Refer to the section 'Behavior Blocker' for more details. 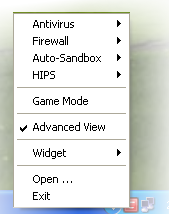 HIPS- Options available are Paranoid Mode, Safe Mode, Clean PC Mode, Training Mode and Disabled. Refer to the section HIPS Behavior Settings for more details. If any of the antivirus, firewall and auto-sandbox settings are disabled, immediately the Security Information in the main task interface and the Widget will turn red alerting you of the status. In addition, a pop-up alert depending on the feature disabled will be displayed. You can select the period for which the security should be turned off from the drop-down. Select the period and click 'OK'. If you have selected any of first three periods, the security component will be enabled automatically after the chosen period. Game Mode - Switches CIS 6.3 to Game Mode to enable you to play your games without any interruptions from various alerts in your computer. The operations that can interfere with users' gaming experience are either suppressed or postponed. Advanced View - Switches between Compact View and Advanced View in the Home Screen. Automatic isolation of unknown applications and real-time virus detection are still functional. Deactivate Game Mode to resume alerts and scheduled scans. Widget - You can select whether the Widget is to be displayed or not and whether it should always be on foreground. Open - Opens the CIS interface. Exit - Closes the CIS application.